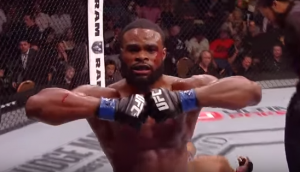 Tyron Woodley appeared to be just a strike or two away from finishing Stephen Thompson in round five last night, and the welterweight champ concedes he should have been more aggressive earlier. The headliner for UFC 209 featured very few, memorable moments, as both welterweights were reluctant to open up. In the final round, Woodley cracked Thompson with heavy punches, but he was unable to put away the vaunted striker. Thompson and Woodley fought to a majority draw in their first bout, which took place at UFC 205 in November.